Remember the Christmas Crackers I received a little while back from my friends in the CQI Christmas Cracker exchange? Well, finally Christmas came and I could open them! What wonderful goodies I received - I am tickled pink! The one above is from Simona in Italy. 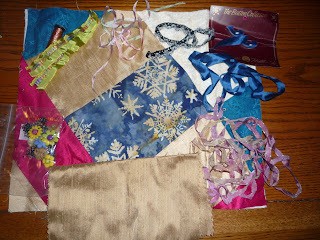 You can see the crazy quilt block that was the outside of the cracker as well as the goodies that were concealed inside. 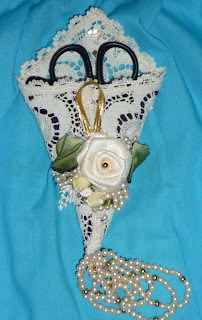 There are is a lovely crochet fan to embellish with as well as a beautiful bejeweled crochet angel for my tree. These are so welcome because I myself do not crochet. The wonderful threads you can see here are perle #8, hand dyed from South Africa, and I can't wait to use them - they are so lovely! There were also buttons, ribbons and beads all picked especially to coordinate with the cq block so I can embellish it to my heart's content. Thank you Simona! 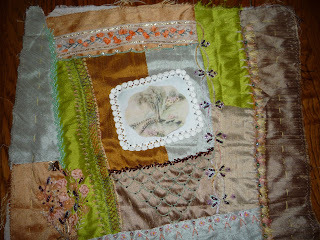 This second cracker is from Meg in the US - another beautiful crazy quilt block to embellish! Meg included a chocolate bar from Europe which I will admit did not last until Christmas because it was outside the cracker and I am very weak willed! lol I did wait to open the cracker itself up though and it was well worth waiting for! 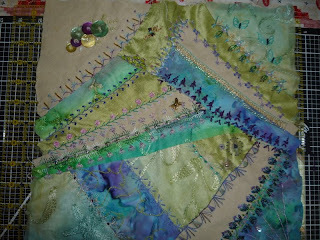 There is extra fabric, beads, trim, metallic thread and the most wonderful ribbons. One very generous length is dyed pink with lovely gold edges. I will find something special to do with it. Thank you Meg! Hi there! I am going to take a brief break from the Build a Seam challenge over the holidays - sorry this week's never got posted! I will be back and raring to go with this right after the New Year. In the meantime, I would like to wish everyone a wonderful holiday season and all the best of everything in 2009! Stay warm! I have just finished my work on Meg's On the Seamy Side RR block. 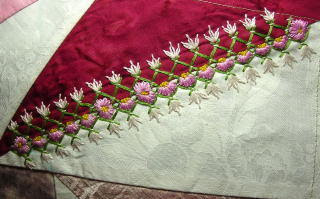 This go around was buttonhole stitch and spider webs. 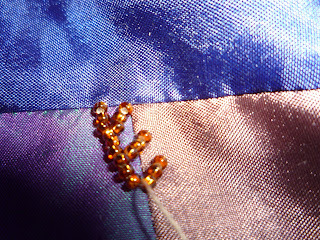 I managed to come up with a small motif of three buttonhole stitch circles, adding the odd bead to them. The second motif I did on Meg's block was the requisite spider web. 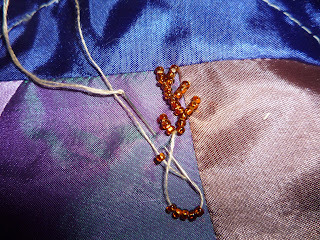 This time I chose to do a corner one for a change, anchoring the strands of the web to the beads in the adjoining seam. The spokes of the web are done in Japanese Buttonhole Thread and Glissen Gloss and the connecting strands are of Glissen Gloss alone. Both of these threads I received in the recent Threads of Friendship Swap at Crazy Quilting International. I built a spider for the web from some pearl beads. 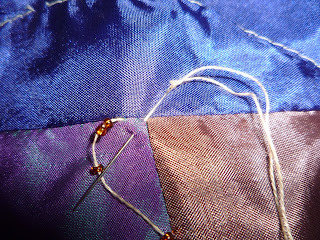 Next I did a couple buttonhole seams. 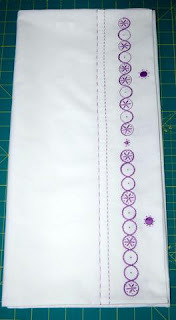 The top one is a curving row of buttonhole stitch with the purple grape bunches added. 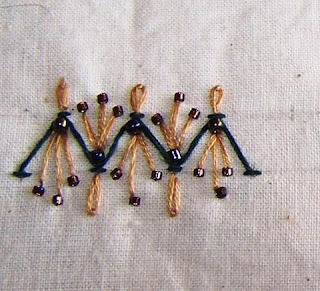 The second seam was Woven Buttonhole Stitch made of two rows of buttonhole stitch facing each other and with Japanese Gold Thread woven through the two lines of stitches. 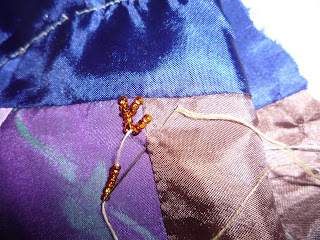 The last seam is a Pyramid Buttonhole Stitch with two rows of the stitches mirroring each other on either side of the seam and silver spacers, beads, and detached chain stitches to dress it up a bit. If it looks familiar it is because it was my Week 11 Build a Seam sample. So, here is a picture of Meg's block as it was ready to go into the mail. I was the last one to work on it so it is heading home to Meg now. I think she will be pleased with it. Everyone did such lovely seams! I know everyone in the round robin enjoyed working on this cool colour palette of Meg's. So this is my last block to work on in this round robin. Now I only need to wait for mine to come home to me. I am quite anxious to see it! Sorry for the awful picture but here is my sample for the Week 11 Build a Seam challenge. I took the Buttonhole Pyramid stitch and then mirrored it underneath, leaving a space of about a quarter of an inch between the rows. Each peak of the pyramids was topped with a french knot and three detached chain stitches. Then in the center between the peaks went silver spacer beads attached with a seed bead. On either side of the spacers are more detached chain stitches. The quality of the picture is awful but hopefully if you click on the picture to enlarge it you can see the details. Well, here's a surprise - I'm early instead of late this week! Here is this week's seam - a pyramid buttonhole stitch, called so because the stitches go and and down in a pyramid shape obviously. Other than that it is just your regular buttonhole stitch. You might notice that mine is above the seam line and wonder why. It is because I will be doing a second row under the seam line mirroring it and then using the space in between for further stitches or embellishments. So, have fun - I'm looking forward to seeing the results! I have just had the pleasure of working on Jeanne's block in the On the Seamy Side Round Robin at CQI. This round robin dictates which stitch we use each go round of the round robin. This time it was the feather stitch so I used that both as a beaded feather stitch seam as well as for the basis of the silk ribon florals etc I added to the lace already on the block. 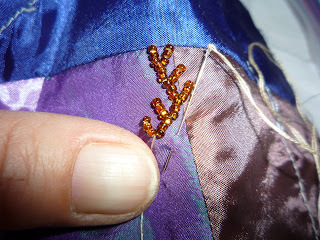 I also threaded some gold braid through the lace above and below the floral design. 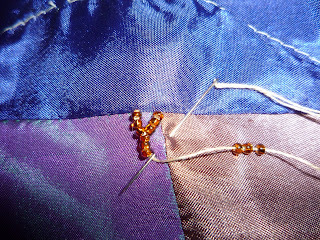 Below this I added my first attempt at a Beaded Hedebo Edge that I found in A - Z of Embroidery Stitches 2 book. This edge shows in the picture of the whole block but not in the detail picture above. 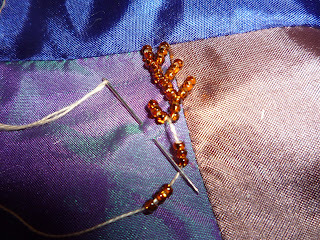 I really enjoy doing feather stitch in beads as shown. 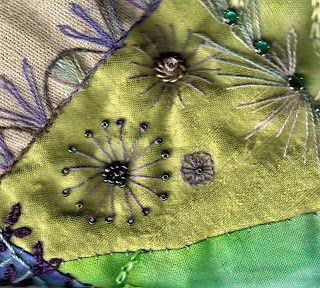 The stitch seems to lend itself so well to being embroidered with beads. This is a front panel for a purse I have been working on. It has taken me awhile to finish it - more "slow cloth"! I think I am done now though and just need to sew up the purse. This will be another project off my to-do list. Well, this is my finished sample from Week 9 of Build a Seam. 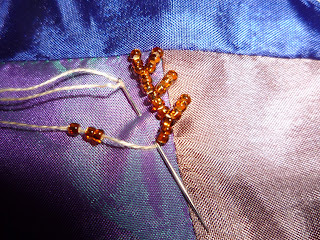 I added small gold seed beads to the short stitches in the buttonhole stitch. On the long stitches I alternated. 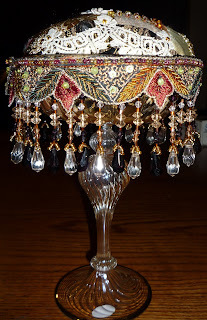 On every other one I added a small pearl bead and three irredescent bugle beads in a fan shape. On the other ones I used a seed bead to attach small flower beads. Sorry to be late but here is this week's Build a Seam. 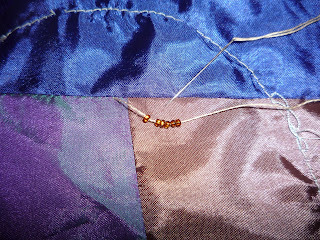 As you can see it is a long and short buttonhole stitch or at least that is what I'm calling it - lol. 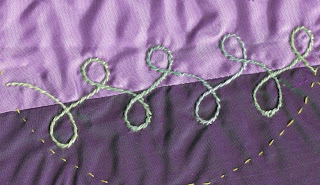 It is a basic buttonhole or blanket stitch with the stitches being alternatively longer and shorter in height. I hope you have fun with this one. 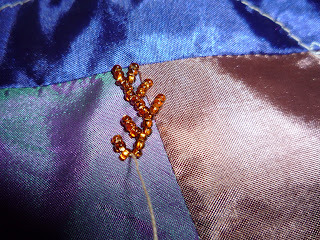 I am so impressed with all the creative seams that are being done in this Build a Seam challenge! I'm learning a lot and am continually inspired by the samples I am seeing. As a last note in this post, here is the sample I came up with on Week 8. It is pretty simple but it did what I wanted in the space it was in so I'm happy! I'm taking part in a Row X Row Robin on the Mailblocks quilting group - trying to get a little experience with "sane" quilting and building up my confidence with it. This is the first Row to come my way to be worked on. Bridgett chose the Spiderweb block for her quilt, providing the sheets for paper piecing it as well as the main blue colour fabric. Above you can see a sample of one of the 12" blocks I made for my row. Here is the quilt top with my row added to the original one by Bridgett. These blocks were a hoot to do! 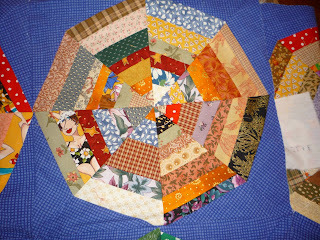 I loved using all the bits and pieces of scraps of various quilting cottons I have around. It is a true scrap quilt - completely random - and I loved working on it. I think I will have to make one of these myself one of these days! for a chance to win this beautiful handmade silk christening gown! Can't you just imagine what a family heirloom this will become? 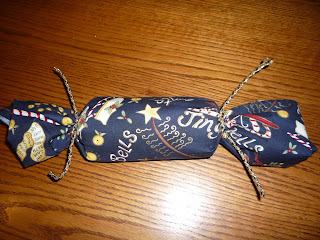 This is another bit of fun we are having at Crazy Quilting International - a Christmas Cracker Swap. These are the two that I have sent out. 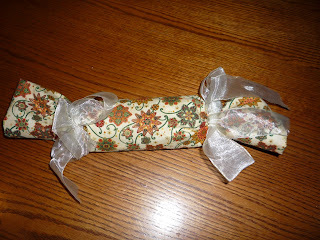 They are tubes wrapped in fabric and filled to overflowing with goodies that can be used in our crazy quilting pursuits. It is a lot of fun to see how much you can fit in the tubes! I have to admit I cheated and took two tubes for each, cutting them apart and then taping them back together overlapping to make a bigger cylinder. lol Just couldn't get enough in the regular paper towel tube. Now, of course, more fun will come when I receive my Christmas Crackers in the mail and get to shake, rattle and roll then while I wait for Christmas so I can open them. This has become an annual event and I really enjoy it. First of all, just a reminder of how the Build a Seam Challenge works. This is a challenge that I am doing on the CQI Novice Site and I am happy to share it here too. Each week a simple seam or framework is posted and the challenge is to see what else you can add to it to make it pleasing to you as a complete seam treatment. We are now in the eighth week but anyone is welcome to join in at any time for as long as you want, to challenge yourself with all of the seams or as many as you like. 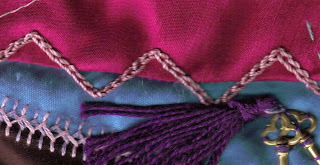 The block I did this one on is getting a little crowded so you will need to ignore the key charms and attached tassel as well as the double cretan seam down below. What we are looking at this week is the chain stitch zigzag on the blue & pink seam. You can do this either in chain stitch as I have or stem stitch or whatever you would like. The challenge is so see what you can add to this very angular seam to make it your own. Have a good week & have fun! These are the samples I came up with on the Week 6 and 7 Build a Seam. 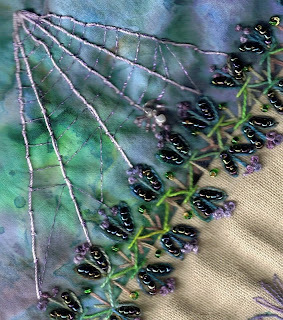 On the first one, the woven stitch, I added a hand dyed lace butterfly in the center of the seam to cover where my hands were too rough and caught the fibers of the pink silk perle. Then I added the tiniest little sequins sent to me by a sweet friend. I usually attach sequins with a bead but these wonderful sequins are so small they would have disappeared under my smallest beads so they were simply sewn on with one strand of matching floss with small straight stitches. With the tied cross stitch from Week 7, I stitched another row of the same stitch on either side and then and then added a gold bead at each intersection. Both of these are simple solutions to the seam challenge but I like both of them! With the help of dh who drew the name, the winner of The Art of Silk Embroidery is Pam! Congratulations Pam, and thank you to who everyone who took the time to comment and tell me their favourite thing about crazy quilting! Pam, I have already taken the package to the post office so hopefully it will reach you before too long! When I saw this candy dish in the store it shouted pincushion at me. So, this weekend at a stitching retreat I was at, I finally finished it! It was a lot of fun and worked out pretty well as I planned. I traced a dinner plate to get a large circle which I pieced and embellished. Then I sewed it up like a yoyo, stuffed it and placed it in the candy dish. I added a beaded fringe and some trim and ta-dah! Done! It is a belated birthday gift for a stitching friend which I hope she will like. This is the view from above, showing the crazy quilted cushion portion. 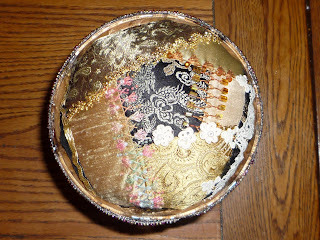 This pincushion was inspired by the beautiful pedastal and beaded pincushions produced by Gerry K. ( http://www.victorianpincushions.com/ ). Please check out Gerry's website if you would like to be truly inspired! 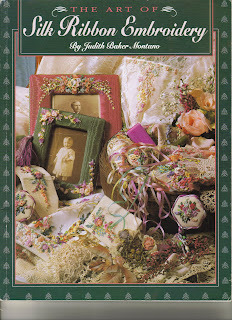 My first "favourite author" when I became interested in crazy quilting was Judith Baker Montano. Learning she was brought up at the Bar X Ranch near me in Alberta, Canada, added to my admiration for her! 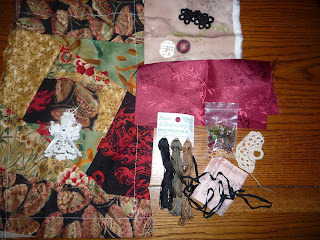 I have an extra copy of her book, The Art of Silk Ribbon Embroidery, and would like to share it with another crazy quilter. If you would like to put your name in for this draw please leave a comment on this post telling me what you enjoy most about crazy quilting. 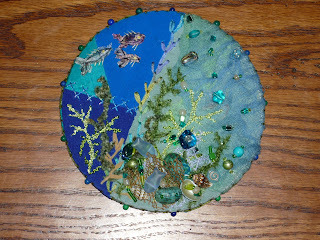 I am heading out of town for a stitching retreat this weekend so will make the draw on Monday. Good luck! These are pictures of a small scissor case I made for a friend's embroidery scissors as a small token of friendship and appreciation. It started with a small square lace doily I came across in the thrift store - it jumped out and shouted scissor case at me! It was fairly easy to come up with a plan to do it. First I took a piece of burgundy velvet and sewed it to one side of the doily, turning the edges of the velvet over and leaving a plain lace section for the flap. Then I folded two "kitty corners" of the doily together and hand stitched it together from where the corners met down to one point. So, now I had a small scissor case, lined in velvet, and the fun part could begin - the embellishing. I sewed a button to the flap and then sewed a loop of gold trim to the front of the scissor case so the flap could be buttoned closed. 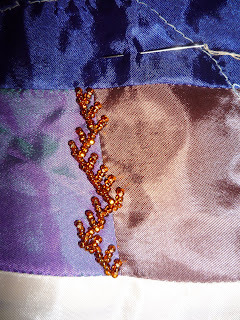 The ends of the gold trim were buried under the next layer - more lace bits. 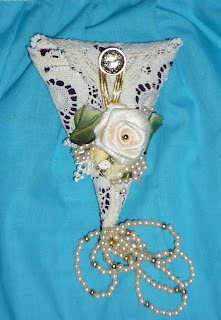 On top of that went ribbon roses, silk ribbon leaves, a few small loops of pearl beads and a few single beads. It was still lacking something so I strung larger loops of beads and attached them to the bottom. It will be a surprise when it arrives but I hope my friend likes it! 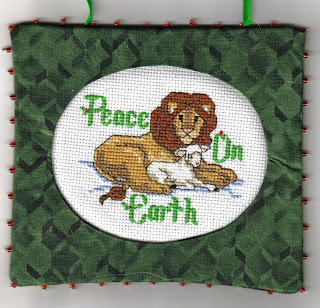 I am taking part in a Christmas Ornament Swap at the cross stitch group on Stitchin Fingers. This is the one that I received from Annie - just gorgeous! Thank you so much to Annie for this lovely addition to my tree as well as the lovely cross stitch pattern she sent along! I am still working on the one for Annie but will post a picture of it as soon as it is done. I still have a couple weeks before it has to be in the mail. I took part in a Pinkeep swap at CQI recently and today I received my Pinkeep from Debbie. I just wanted to share a picture - it is such a great under the sea scene. My favourite part are the fish at the top. I haven't figured out how they were done yet but I really like them! Thanks Debbie for the pinkeep and to Lyn for organizing this whole swap! This week I wanted something lattice-like, so finally settled on Tied Cross Stitch. It is quite different from the others we have done so far but I thought lattice would lend itself well to floral additions. Just a thought , of course! The picture doesn't show up well because of the colours being so similar but if you click on it to enlarge it, it should be fine. I have also included a stitch diagram to help clarify it. I'm looking forward to seeing what everyone comes up with - the samples I have been seeing are wonderful! I thought I would share a few more samples of what people have come up with in the Build a Seam. 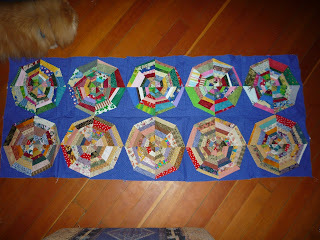 This first one is Thelma's seam for week 3. I think it is just gorgeous! This second one is the sample Kathy did for Week 4. I think this would be beautiful on a block. I love the elegance of it with just two colours and the matching beads. This last one is really special. The seam is from Week 1. Linda has decided to use the seams on pillowcases. I think they will be beautiful with the rows of seams on them - what a great idea! 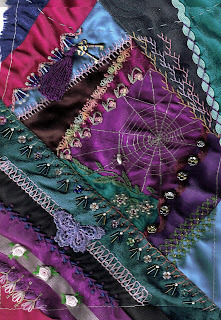 If you have a seam to share please leave a comment with the link to your blog or flicker pictures - wherever you are keeping the photos of your seams. Thanks!